People discover your app and decide whether to install it on your app's directory page. Use this space to tell your app's story, compellingly preview your app's capabilities and user experience, and ultimately attract users. Help people understand what your app does with impressive demonstrations of utility and personality using video, images, text, and more. Let's learn what goes into a great App Directory page. A great name can evoke the experience of what it's like to use your app. Choose a name that's easy to remember, say, search for, and spell (so, sadly, no emojis). Maybe something sassy. Keep it short and snappy, and not longer than 35 characters. Be distinctive without being obscure. Straight forward, straight to the point, straight to the heart. Your description is a powerful tool to communicate how your app will make people's lives at work better. We've written more on creating great descriptions. We give you two opportunities to describe your app: a long and a short description. Be brief; concise. Use fewer than ten words. Provide 3-5 sentences about who your app is for, what your app does, and how it will help them get work done (or maybe fill their life with a little bit of fun). Be clear and clever. This a *strong message*. This _is emphatic_. This <https://example.com|links somewhere relevant>. This is strong message. This is emphatic. This links somewhere relevant. Make your long description easier to read with simple Slack formatting mark up. Don't stuff your description with keywords — it's distracting and won't help your app's discoverability. Your app icon should catch people's eye — or stop their thumb — when they're scrolling through the directory. Make it unique, distinctive, and simple enough to pass the squint test. We'll show your icon in several places and at a few different sizes around Slack. Keep it simple so people can understand what it is, even at a small size. Please don't submit something that resembles Slack's logo or Slackbot. Your icon should be 512x512px or bigger and have a full-bleed background. App images can give people a sense of how your app works, and can illustrate important features introduced by your long description. You can add up to six high-res app images to your app page. 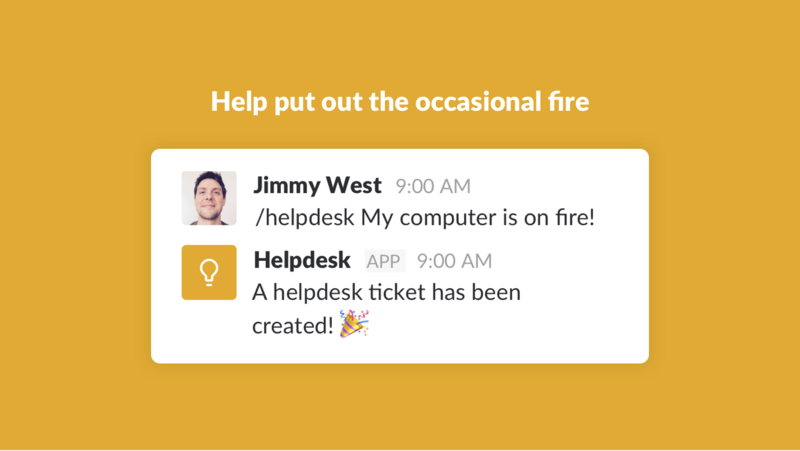 Start with a couple app images that show your app being used inside Slack, and reserve a couple spots to specifically highlight your app's most valuable features. Use our design templates to guide your app image. Images need to be 1600px by 1000px (8:5 ratio). Avoid showing specific devices, like phones or laptops. Please show your app in the context of Slack, not other tools. We accept .jpg, .jpeg, and .png file types. Files should be under 21mb, please. Videos might be the single most efficient way to communicate the benefits of using your app. You can add a YouTube video to your App Directory page. You can say a lot by creating a screencast with minimal editing, or you can go full-production with animation. How you tell your story is up to you. Whichever direction you take, be sure to tell people how your app works, who it's for, and what they can accomplish with it within Slack. Keep it short and sweet: somewhere between 30-90 seconds is a good rule of thumb. Your video will need to be a publicly-accessible YouTube link, not a link to a channel or playlist. Make sure to turn on closed captioning and turn off ads in YouTube's settings before submitting your link. 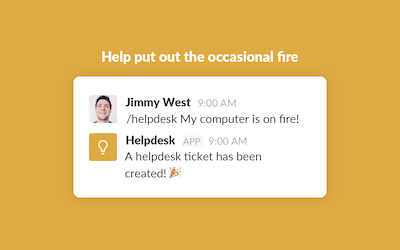 Show your app specifically in the context of Slack's UI. Your app has a profile inside Slack, just like people do. When you upload your app to the directory, you can pick a color that reflects your brand. It's like your app's aura. Pick a color that complements your app icon, since it'll be shown behind it in your app profile within the Slack client. Choose a color that works well with white text. So everyone can see your app's plumage. When picking categories, think about who is most likely to use your app and what they'll want to use it for. Consider the places they'll be most likely to look for a solution like yours. 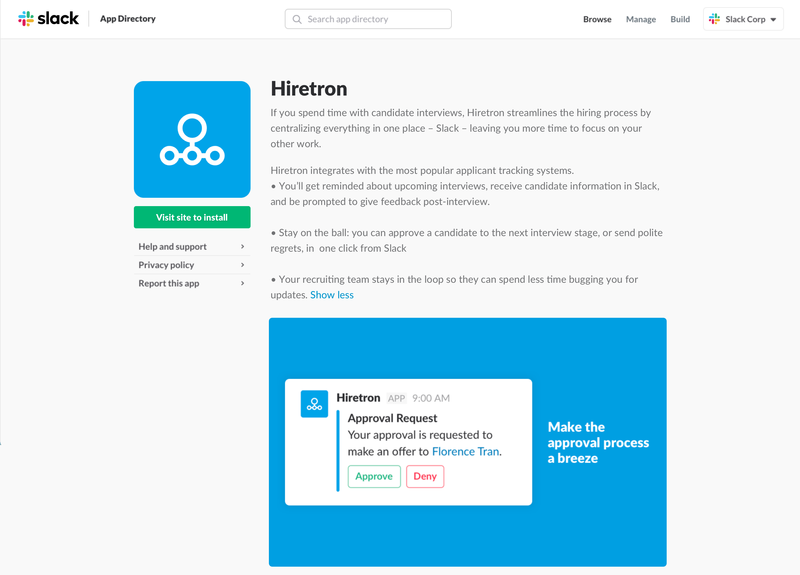 One way teams can discover your Slack app without having to browse for it in the Slack app directory is by having Slackbot suggest installing it when users mention links associated with your app. By adding a small amount of HTML metadata to your site templates as explained here, app suggestions will be enabled for your app. Make sure you don't infringe on anyone else's trademark or copyright, Slack's or otherwise. Consult our app-directory-assets Github repository for the most up to date templates and resources. Of course, you're already following the App Directory Submission Checklist, right?